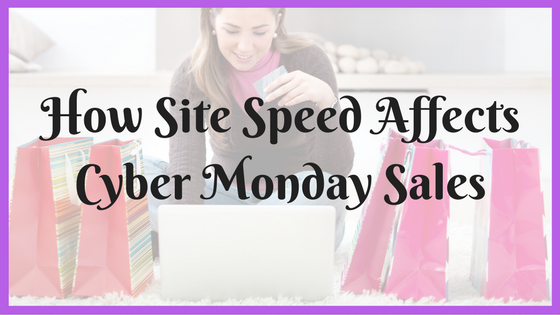 The Monday after Thanksgiving consistently ranks as one of the busiest online shopping days in the United States. Dubbed ‘Cyber Monday’, millions of consumers take to the internet to buy holiday gifts. According to a report by Adobe, 2017 was a record-setting year for Cyber Monday, with online retailers selling more than $6.59 billion worth of goods. That number could be even higher, however, if online retailers optimized their sites for faster load times. Site speed plays an important role in an e-commerce’s site conversion rate and total sales. Generally speaking, slower sites will have a lower conversion rate and generate fewer sales than their faster counterparts. A study conducted by the world’s largest online retailer, Amazon, reinforced this belief. Amazon found that for every additional 100ms it took visitors to load its website, the company lost 1 percent in sales. Google conducted a similar study in which it found that traffic decreased by 20 percent when users were forced to wait an additional half a second for the search results to load. To further emphasize the importance of website speed, a study conducted by Visualsoft found that the slowest online retailers lose roughly 29 percent of potential sales from stagnant load times alone. Visualsoft also found that more than half of the U.K.’s top e-commerce sites have “poor” page speed. There are ways to speed up e-commerce sites and improve sales, however. If a website uses a content management system (CMS), for instance, the core CMS files as well as any third-party plugins, extensions or themes should be updated to the latest version. Additionally, optimizing product images prior to uploading can reduce page size and subsequently improve load times. If an e-commerce site contains oversized, high-resolution images, it will increase visitors’ load times. Therefore, online retailers should shrink and optimize their product images beforehand. Perhaps the most effective way to improve website speed is to use a content delivery network (CDN) like CDNsun. This involves hosting your website on multiple servers while prioritizing delivery based on the geographic location of the visitor. The general idea is to shorten the physical distance between the visitor and the server. CDNs achieve this by hosting the website on multiple servers spread throughout the world. These site optimization tips don’t apply strictly to the holiday season; they’ll benefit online retailers 365 days a year.